Southern Spain's answer to Benidorm, Torremolinos is a vast purpose-built holiday resort situated 10 miles (16km) west of Malaga, on the road to Marbella. The region has been inhabited for a startling 150,000 years, according to the wealth of archaeological remains uncovered in the area, but the resort itself is determinedly modern, with no evidence of the long history of human habitation. Holidaymakers looking for a cultural experience will be disappointed, as Torremolinos, particularly in high season, is noisy, hedonistic and fast-paced, 24 hours a day. What makes this energetic resort popular is the six miles (10km) of wide, sandy beaches, the numerous water sports on offer, the masses of bars and restaurants, and the exhilarating nightlife. Torremolinos attracts tourists of all ages from all over Europe. There is a large gay scene, and the 18 to 30 age group tends to dominate in the peak summer months, but the resort is also popular with families. There is a great variety of shops in Torremolinos, ranging from international clothes stores and designer boutiques to lots of small touristy shops selling souvenirs. Good buys include the local jewellery, leather goods and the famous Spanish Lladro porcelain. For self-caterers, there is a good selection of corner shops and supermarkets stocking well-known international brands. Calle San Miguel is at the heart of the Torremolinos shopping scene: it is an attractive pedestrianised street, flanked by small shops and cafes and is a good place to sip sangria and people watch for those not interested in shopping. More extensive shopping can be found in nearby Malaga. Torremolinos is packed with restaurants catering for the tourist trade and menus, usually in a few languages, offer good international staple dishes such as fish and chips, steak, pasta and schnitzel. Popular options include Kate's Cottage and Bistro Europa. However, some excellent Spanish restaurants are also around, particularly those serving tapas. The best seafood restaurants are in the fisherman's district of La Carihuela, which has been relatively undisturbed by high-rise hotels and has retained its Andalucian coastal charm. The upmarket harbour at Puerto Banus is only ten miles (16km) along the coast and is packed with good restaurants overlooking rows of expensive-looking yachts. For something a little different try The Carvery (Italian), The Kathmandu Nepali Indian Restaurant (Indian), and Shang Hai Restaurante Chino (Chinese). The nightlife in Torremolinos can be fairly intense, with dozens of bars and clubs catering for all tastes and persuasions. A good place to start the evening is in one of the tavernas in Calle San Miguel or in one of the cafés and restaurants that line the promenade. 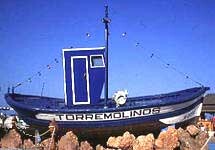 Torremolinos is also home to the chiringuitos beach cafe/bars, focused in La Carihuela. The clubs start to open at around 10pm and the Palladium disco is a great favourite. The best selection of clubs is along Avda Palma de Mallorca. There is a big gay scene in Torremolinos centred on La Nogalera, where the clubs vary from the mainstream to drag bars. Exotic shows are a feature here and are popular with both the gay and straight visitors. Most holidaymakers come to Torremolinos to spend idle days on one of its beautiful beaches and nights partying in the many nighttime entertainment venues. The largest and most popular beaches are Playa La Carihuela and Playa El Bajondillo, both offering safe swimming and all sorts of water sports. Bars and cafés along the promenade offer respite and refreshment away from the sun. The nearby water park, Aqualand Torremolinos, is a great family day out, as is the nearby Crocodile Park. Bull fights at the Plaza de Toros are another exciting activity. Although not famous for its cultural attractions, Torremolinos offers some pleasant historic neighbourhoods in La Cariheula, and a few other attractions, including the Pimentel Tower, Battery Park, and the Pablo Ruiz Picasso Cultural Centre. The spectacular hilltop town of Ronda is also worth a visit for those wanting to escape the beach for a day. Tourists are regularly pestered by salesmen selling everything from trinkets to timeshare apartments in Torremolinos. The centre of the resort is fairly run-down in places; the suburbs of Benalmadena and Fuengirola are cleaner, friendlier and cheaper.